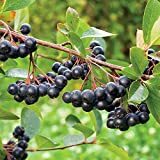 Aronia berries for sale – Easy plant to grow with edible fruits, planting in spring to autumn, better to buy plant or another option to start from seeds yet more challenging. Growing information: perennial plant, growing hardiness zone: 4-8, water needed – average to big amount, light conditions – full sun to partial shade, height: 0.5-4 m, 2-12 feet. Blooming in the spring to summer in round shaped flowers that appear in white color. Fruits harvesting in the summer to autumn in round shaped flowers that appear in red, black or purple color. 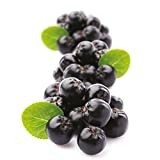 Aronia berries for sale – What need to know about Aronia berries? Aronia berries for sale if you want to buy it fresh the plant yield in the autumn, can buy in frozen or dried, to make juice possible to use dry but for jams dry Aronia berries it’s problematic, the taste of Aronia berry when it’s fresh is unique and most of the people won’t like it, better not to eat it fresh because it’s toxic seeds.